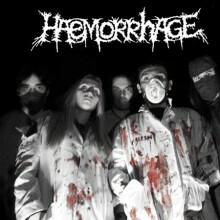 Respected fans if you are reading this, you are on on the page of the singer haemorrhage in our eLyricsWorld. Our database consists of data about 52389 artists throughout the world as well as 829824 songs 123 of which are from haemorrhage. Besides the the biography of the artist, on this page you can see short piece of information about them, covers date of birth, genre, record label Be conversant with all the development with haemorrhage by adding RSS link. If you prefer you could directly visit the page you are on right now and check out the latest songs about the singer.